Cron jobs, or scheduled tasks, must be enabled in order for Magento to operate properly. Because MageRewards is built upon Magento's functionality, it also inherits this requirement. Evidence of Magento not picking up CRON TAB tasks properly in MageRewards is if the catalog redemption point rules block disappears one day after you applied all rules. If this is the case please consider the following content. o run Test Suite, click on the Run 'Test Suite' Diagnostics button. Next you'll see several lines of diagnostics. Scroll down until you see Magento - Cron. Follow the directions below to setup your cron. If you're using cPanel 11, you can setup a Cron Job using the advanced tab. 2. 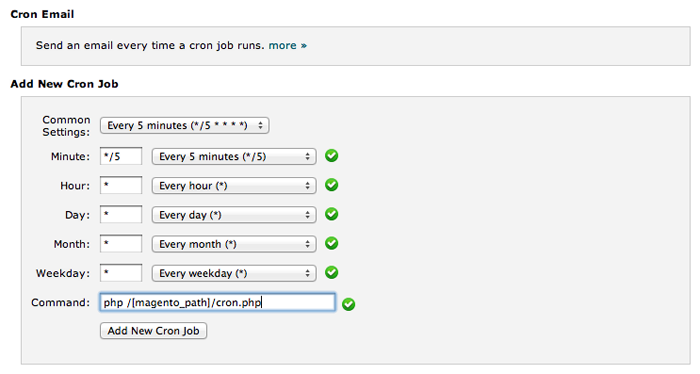 Click on the Cron Jobs icon. 4. Click Add New Cron Job to insert this cron job in the system. You can place some probes into cron.sh and cron.php to confirm things are running. After 6 minutes you should see both these files in Magento's directory if cron is running. If you have tried everything and still cant get cron to work, perhaps this unsupported workaround might help. Adding the following to the top of index.php will cause cron to run in the background whenever someone accesses your website.